The 2009 comedy I Love You, Beth Cooper didn’t impress me much, but the charming Craftsman-style bungalow that the Cooverman family lived in did. When the bullies broke in and start destroying the kitchen, I could hardly stand it. I immediately began searching for information about the house to find out if it was real. I learned that the exterior is a real house located just outside Vancouver, but the interiors were sets on a soundstage. He screwed up the courage to invite her to his house that night for a graduation party. Surprisingly, she and her two friends show up. There are a couple of beautiful vintage fireplaces in the house. The movie was based on the popular novel by Larry Doyle of the same name. As soon as they left the house to go off on other adventures, I lost interest and fast-forwarded through the rest! The Production Designer was Howard Cummings. Set Decoration by Mary-Lou Storey. 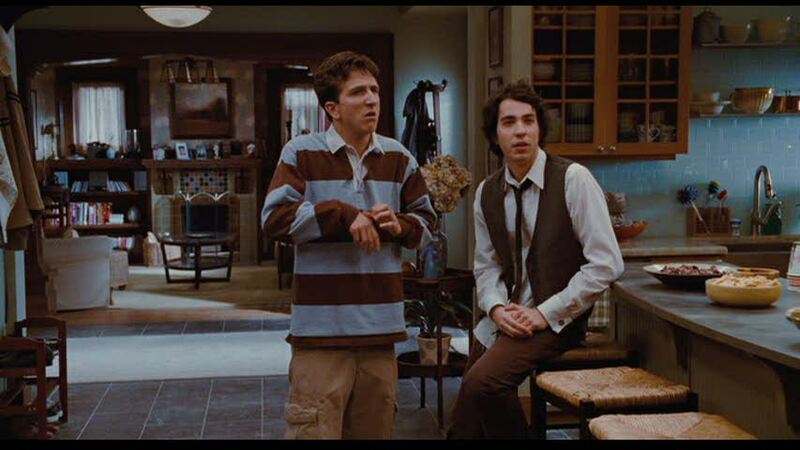 Did anyone else see this movie and think that the house was the best thing about it? The Lake House From "What About Bob?" Loving that blue subway tile in the kitchen! Aren’t bungalows so dreamy? Did you have a good weekend? We got so much snow and we couldn’t do much, but staying at hoe and watch some great movies! I loved the house – but I have to say that I also really liked the movie. lol I thought it was cute. Did you notice that everyone’s clothes matched the interior of the house? Everyone is wearing brown and light blue and white. 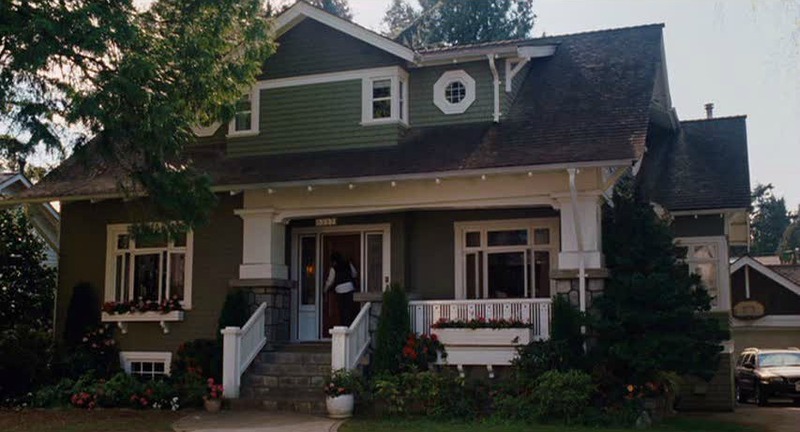 I didn’t see the movie, but I love craftsman bungalows! Thats a lovely bungalow. You know I love tile fireplaces since I have one and most everyone else does in my neighborhood. So I love that you pointed those out. I did not see this movie and WILL not see this movie but I’m glad you showed off the house. I thought parts of the movie were funny. But I did like the house best. I also read the book and I think it was a little better than the movie. 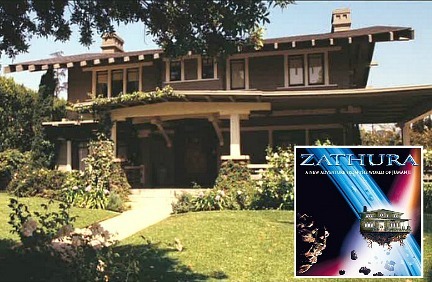 I haven’t seen this movie, but I love the Craftsman styled home. I would love to live in a house like that. There’s been alot of movies I have seen that weren’t that great, but the houses were beautiful. Like not too long ago, I watched a tv movie called, “Backyard Wedding”. It wasn’t that great, but I loved the house. It’s one I would love to live in. You had me at “craftsman”. I do like the house…. though I don’t know why it seemed dark to me. I haven’t seen it, but thank you for the post…and the warning. I have a Craftsman Bungalow patiently waiting to be beautiful, so, I definitely appreciate the inspiration! I want to make use of absolutely every single little bitty space. 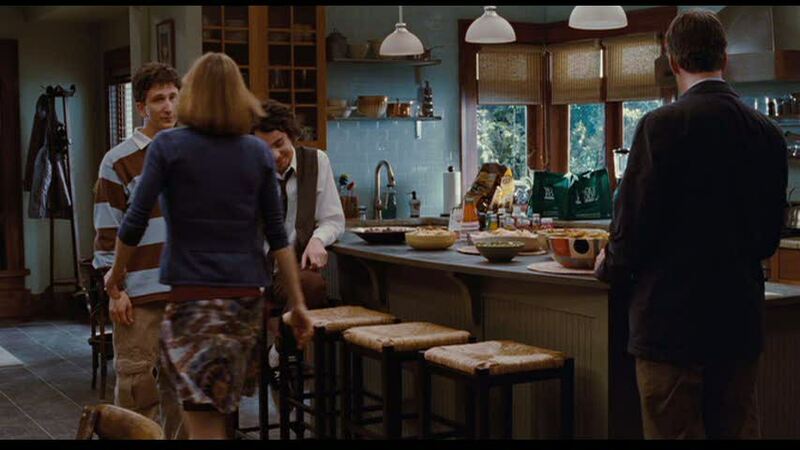 ps I enjoyed “Zathura” and its gorgeous house, but the “Must Love Dogs” bungalow is definitely more my cup of tea! That is adorable. I love the front porch. I have the traditional twisty iron railings from mid century ranches and the previous owner did not take good care of them. Thus I am constantly on the lookout for interesting railings and banisters. I was going to say that I would have loved to have his room as a teenager, but realized I would still love to have a room with built-in bookshelves and a window seat. It is a lovely bungalow. I like the chunky columns on the porch. I like the blue tiles and open shelving in the kitchen, too. There were a number of these Craftsman homes in the neighborhood in which I grew up, Julia. I’ve always dreamed of owning one but sadly that dream was never realized. It would be fun to know how many movies were made where this style of home was featured. I saw this movie and it was horrible. I didn’t notice the house though. It really is lovely. I agree with you. 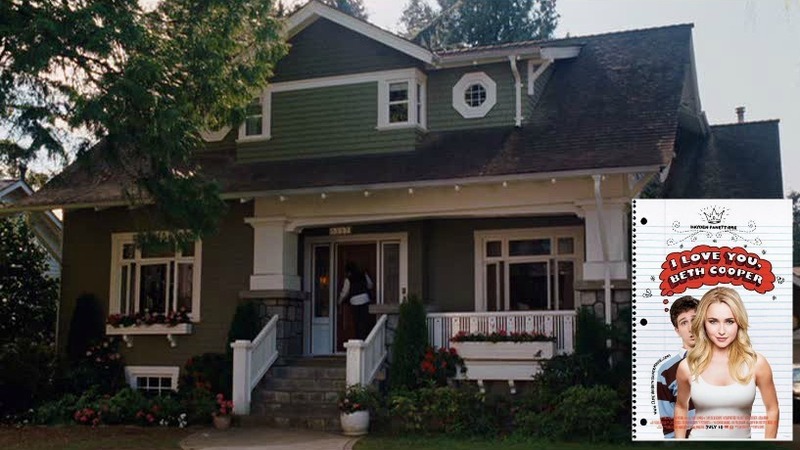 Didn’t love the movie, but they “nailed” the craftsman style with the interior shots. Gorgeous house and kitchen! I didn’t see the movie, doesn’t sound that great. Thanks for sharing! What a lovely warm kitchen! I never saw the movie, I had no desire to, and now I really don’t have the desire to! I do love the kitchen though, I love the island and light blue wall color. 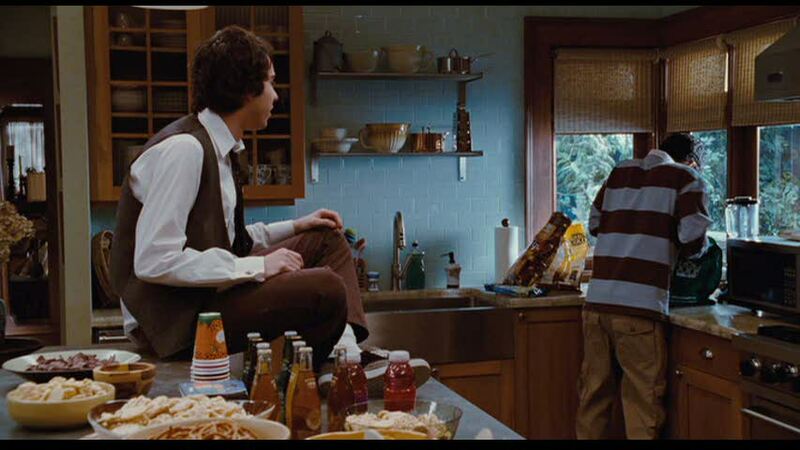 I love additional seating in any room of the house, so I really loved the window seat in the main character’s bedroom, very cool built ins as well. Those colorful fireplaces are so beautiful! Very inspiring, I like the nice pop of color. Love how you bring us all of the insider info! I haven’t seen the movie, but I love the house! 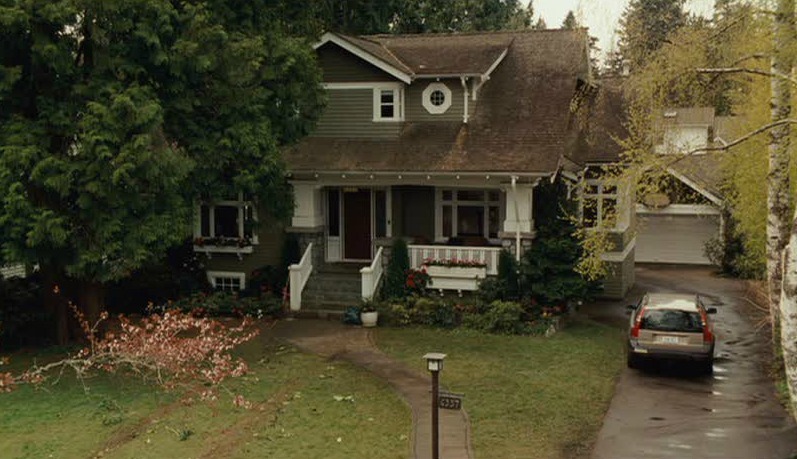 I hope you will feature the house from “When A Stranger Calls”, the remake from a few years back. That house is FAB-U-LOUS! Watch it, I know you’ll agree! Wow if you thought that kitchen was small I wonder what you would think of mine! Lol, I love small homes and mine is just over 900 square feet but I’ve made every inch count. I love the fireplaces in this house, with the bookshelves. Not a fan of the blue kitchen tile though. Thank you for posting this. I always look forward to Movie Mondays! I haven’t seen the movie but I do like the house. The exterior carpentry is wonderful, beautiful window frames and porch banister. The kitchen is lovely, especially the beautifully dressed corner windows above the work surfaces and dining area. I like subway tiles but not in this colour. Am I just being boring and unadventurous? I like the bookcases on both sides of the fireplace better than the fireplace itself. The mantelshelf is nice and chunky, though. I would have loved to have a bedroom like that when I was young, with large windows and window seats. The built ins are inspired, a good way to use up awkward space. Nice house, thanks for showing it to us, Julia. Sorry Julia but you know the rules: every movie made in Vancouver – ever – is just awful, awful, awful. Love this house though — especially the front porch. This is kind of a hate it and love it house for me. I love the exterior, the bedroom (especially that gorgeous window seat and those built-ins!) and the blue tiles in the kitchen. Everything else: not for me. Way to dark, old fashioned and depressing. Hey, love the posts! Hopefully, soon you will feature the main houses from the T.V. show Parenthood. I would love to get a better look at them. When I saw this I couldn’t get the boy’s bedroom out of my mind. I love the window seat and the built-ins! 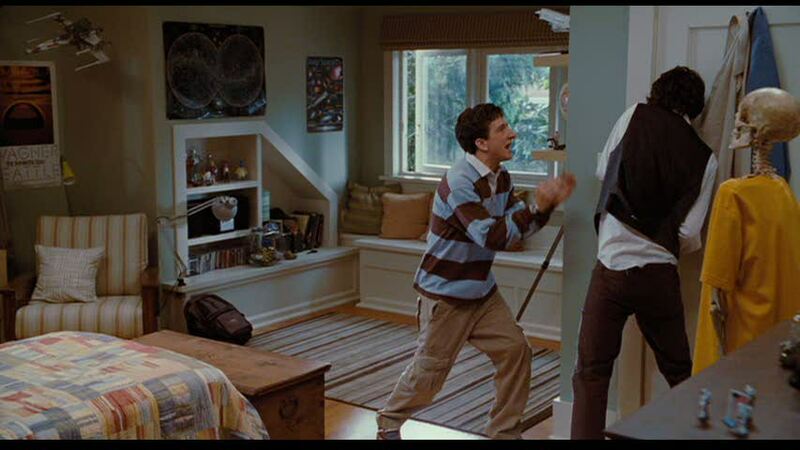 By far my favorite part. I have a weakness for built-ins! The color palette in that room I could see in my second son’s room too. Love it! Thanks for doing this house! 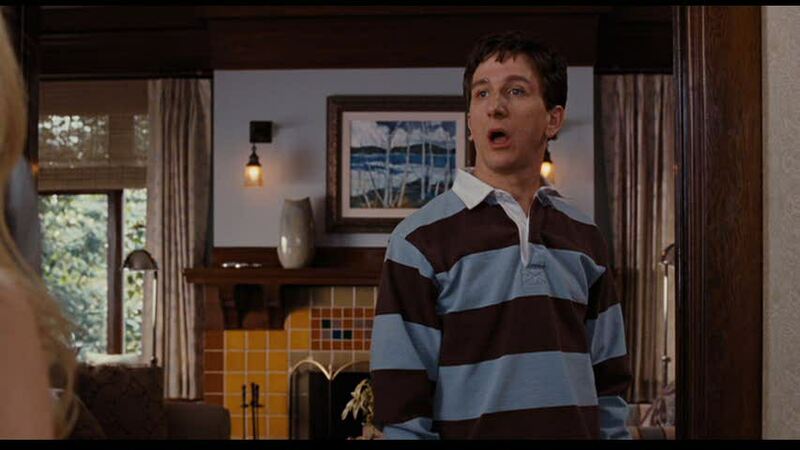 Thanks Julia for this post, I agree with you, that the best of the movie was the house. Chris Columbus, as director always featured great houses. But if you like craftsman bungalow, you must see the house of Story of Us an old movie with Bruce Willis and Michelle Pfeiffer!! It is gorgeous. And the comment that Claire made it is incredible, but real!!! Just curious…can anyone guess or come close to the shade of green the exterior is? I love it!!! !